Histopathologic example of segmental arterial mediolysis. (A, B) Microscopic evaluation of an affected mesenteric artery with linear fibrin deposition at the adventitial–medial junction, medial gaps, and dissecting pseudoaneurysms. (C, D) At increased magnification, vacuolar degeneration of medial smooth muscle can be visualized. (A, C: hematoxylin and eosin stain; B, D: elastic van Gieson stain). Bars = 300 µm (A, B) and 100 µm (C, D). Reprinted from Tyler Hall E, Gibson BA, Hennemeyer CT, Devis P, Black S, Larsen BT. Segmental arterial mediolysis and fibromuscular dysplasia: what comes first, the chicken or the egg? Cardiovascular Pathology 2016;25(2):113-115, with permission from Elsevier. A 52-year-old man with a past medical history significant for hypercholesterolemia and systemic hypertension presented to an outside hospital with acute-onset, diffuse abdominal and bilateral flank pain without fever, constitutional symptoms of infection, or vomiting. On physical examination, abdominal tenderness was present, but abdominal guarding, peritoneal signs, and costovertebral angle tenderness were absent. Computed tomography of the abdomen and pelvis demonstrated bilateral renal infarctions that were likely subacute, raising suspicion for systemic embolization. To evaluate this further, transthoracic 2-dimensional echocardiography with Doppler imaging was performed, which demonstrated normal left ventricular structure and function without evidence of valvular vegetation, thrombus, or interatrial communication. Serologic testing of factor V Leiden mutation, prothrombin gene mutation, lupus anticoagulant, beta-2-glycoprotein antibodies, anticardiolipin antibody, and homocysteine level did not identify a common genetic or acquired cause of thrombophilia. The possibility of arterial dissection predisposing to renal infarction was assessed next using computed tomographic angiography (CTA). This study revealed a normal thoracic and abdominal aorta but noted mural thrombus of the celiac axis, superior and inferior mesenteric arteries, infrarenal branch of the right main renal artery, and left internal iliac artery. The study did not visualize underlying dissection of the affected blood vessels. The patient was discharged on therapeutic warfarin and analgesics and was instructed to follow up in the hematology ambulatory clinic. Two weeks after his initial presentation, the patient presented to the emergency department at our institution with persistent abdominal pain and hematuria. These symptoms were not associated with systemic hypotension, tachycardia, the development of constitutional symptoms, or other specific complaints. Because of his ongoing symptoms, repeat CTA was performed and demonstrated a similar distribution of visceral artery thromboses as his initial CTA, with the addition of a splenic artery thrombus and associated splenic infarction. There was also new evidence of dissection of the celiac (Figure 1A) and superior mesenteric arteries (Figure 1B), hepatic artery dissection and aneurysm measuring 2.1 cm × 2.0 cm (Figure 1A), and bilateral common iliac artery dissections and aneurysms, as well as left renal artery wall irregularity with focal dissection and thrombosis (Figure 1C). Owing to rapid development of the hepatic artery aneurysm in the 2-week period between the 2 CTA scans, infectious and inflammatory conditions, including medium-vessel vasculitides such as polyarteritis nodosa or antineutrophil cytoplasmic autoantibodies–associated vasculitis, were investigated further. However, the patient did not have preceding symptoms suggestive of any illness, and laboratory testing for antineutrophil cytoplasmic autoantibodies, antinuclear antibodies, complement, and hepatitis serologies returned in the nondiagnostic range. The C-reactive protein level and erythrocyte sedimentation rate were elevated, but sterile blood culture tests showed no evidence of bacteremia, and magnetic resonance angiography of the abdomen did not demonstrate vascular wall inflammation, thickening, or edema. Positron emission tomography–computed tomography was also performed, which did not show evidence of fluorodeoxyglucose avidity of the vasculature, thereby excluding active vascular inflammation of the affected arteries. Furthermore, evaluation for neck, cerebral, and lower extremity arterial vascular abnormalities to stage the patient’s disease using magnetic resonance angiography (MRA) and Doppler ultrasound, respectively, did not indicate involvement of these arteries. The patient had a vascular syndrome characterized by multiple visceral arterial dissections with thrombosis and aneurysms, including renal artery abnormalities that occurred in the absence of an underlying hypercoaguable, embolic, infectious, or rheumatologic disorder. Thus, the differential diagnosis for the patient’s primary arteriopathy included segmental arterial mediolysis, fibromuscular dysplasia, Marfan syndrome, Loeys-Dietz syndrome, and Ehlers-Danlos syndrome type IV. Given renal artery involvement with concomitant, extensive visceral artery abnormalities in the setting of a normal aorta, the patient’s presentation was thought to be most consistent with segmental arterial mediolysis. Segmental arterial mediolysis is defined by a noninflammatory arteriopathy that affects medium-sized arteries, particularly the branches of the abdominal aorta, but may also involve the carotid, cerebral, or coronary arteries.1Incident cases of segmental arterial mediolysis are reported across all age groups, but most patients present in their fifth or sixth decade of life, and men are more commonly affected than women. 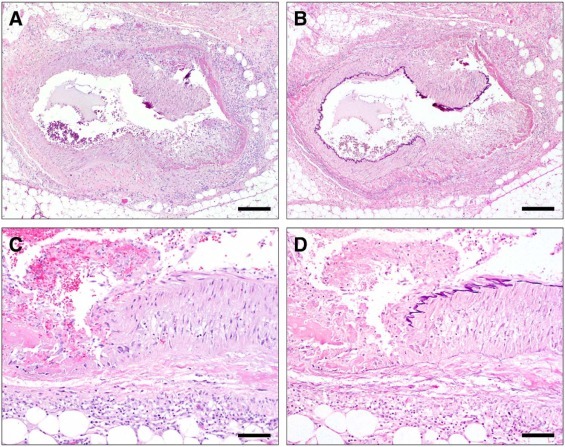 The pathogenesis of segmental arterial mediolysis is due to vacuolar degeneration and lysis of vascular smooth muscle cells in the outer media layer of the vessel wall (Figure 2). After onset of vascular injury, there is separation of the outer medial muscle from the adventitial layer, which promotes transmedial mediolysis and the formation of intramural hematoma, dissection, and aneurysms. This mechanism is in contrast to intimal injury, which is the inciting mechanism in the more classic forms of dissection frequently seen in the aorta. No specific genetic, inflammatory, or infectious nidus has been identified as an initiating factor of the vacuolization and lysis of vascular smooth muscle. As in this patient, the most common clinical presentation is abdominal pain, although resulting hemorrhagic shock from arterial rupture can occur.